After the great wars in Gaza are over, the daily struggle for survival begins, aiming at defeating the shortage and the hunger. Anita Auerbach, a senior representative of the International Committee of the Red Cross in Gaza, explains why she is also optimistic. It is rare to meet someone who talks about the Gaza Strip with bright eyes. “I worked in many places – Sudan, Pakistan, Chad, Lebanon, Haiti, Kenya – but this is my favorite place so far,” says Anita Auerbach of the International Committee of the Red Cross. 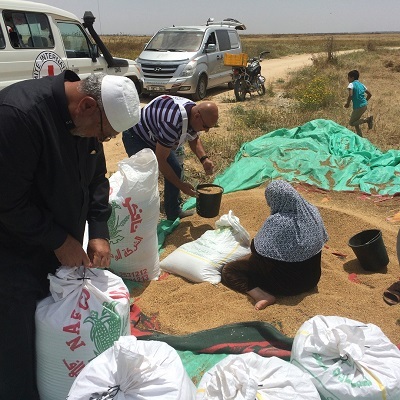 Auerbach heads the EcoSec Unit in the Gaza Strip, whose mission is to help people achieve economic security- in a variety of ways, in accordance with the complex situation on the ground. The conversation, held at the offices of the Red Cross in Tel Aviv, is unusual, especially since you will not hear from Auerbach a hint of political positions or frustration. This approach is what allows the Red Cross to be the only international organization operating in the most sensitive area in the Gaza Strip – the area near the border fence with Israel. EcoSec’s mode of action is illustrated through the following story: In 2014, palm trees in the Gaza Strip were on the verge of collapse due to the spread of the red palm weevil – a large beetle that drills huge holes in trees and kills them. EcoSec, together with the Ministry of Agriculture of Gaza and other organizations, have ruled out the use of aggressive agrochemicals. “Because the insecticide is not aggressive, the natural enemy of the beetle is multiplying”, says Auerbach,” Now we have transferred the responsibility for the project to the Ministry of Agriculture in Gaza and to the farmers”. EcoSec, which is responsible for dozens of projects in the Gaza Strip, is looking for solutions to the problems it faces in cooperation with the local population and authorities, without changing the world’s order and without harming the existing systems. Worldwide, the organization employs 146 international workers and 455 local employees. The unit’s annual budget in Israel and the territories is just over $ 1.5 million. The Red Cross’ budget comes mainly from donations from governments that are signatories to the Geneva Convention. A much smaller percentage comes from the national Red Cross organizations, and from bodies such as the European Council. 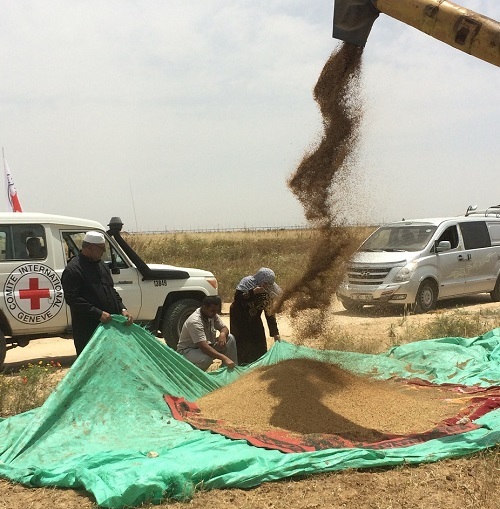 Unlike aid organizations that specialize in specific issues such as water, health or agriculture, the Red Cross is a multidisciplinary organization. So if a problem arises, for example, of an agricultural area with mines, a comprehensive solution can be implemented. “There is a lot of expertise in one room,” says Auerbach. 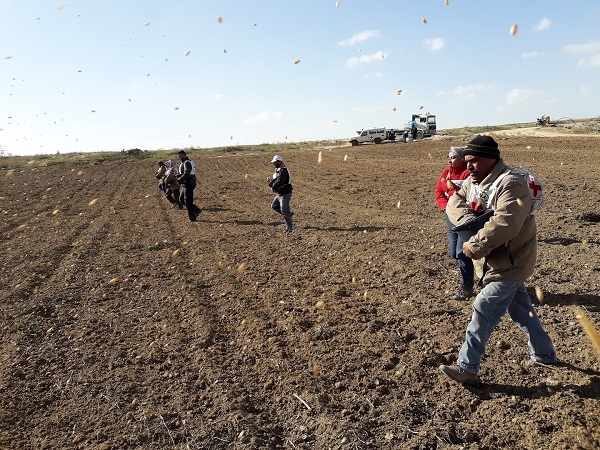 Wheat sowing at the border area of Beit Hanoun, January 2017. It sounds very complex. How do you decide where to operate, and how? The border area of Abasan (east Khanyounis) during wheat harvesting in May 2016. What other places in the world are you focusing on? During Operation Protective Edge, EcoSec’s work focused on providing aid – supplies of water, mattresses and food to the population in Gaza. To Gaza, Auerbach has already arrived during the so-called “period of recovery” at the end of the fighting. During the recovery period, the unit does not deal with emergency operations, but rather tries to give people tools to help them make a living. Auerbach, originally from Britain, has a master’s degree in agricultural economics, and her thesis dealt with farmers adapting to climate change in arid regions. Since February 2014, she has been living in Jerusalem with her husband and their two small children. She works most of the time at the Red Cross office in Jerusalem and goes to Gaza every few weeks. How does the population treat you? “We work mainly with older farmers, and many of them have an open mind. My work is nice because people on all sides identify with some of the problems we face – climate change or pest control. Pests, for example, have no borders. If they spread, they can reach Egypt and Israel. The farmers, especially the older ones, remember well the work with the Israelis. In recent years, there has been a significant increase in the number of pests that farmers in Gaza face because of climate change. Dealing with them is more difficult because of the limitations that Israel imposes for security considerations on the types of materials that can be used. 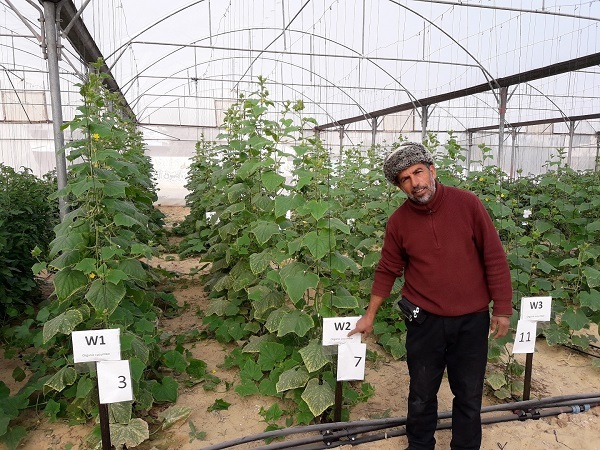 “Agriculture is an area that is already suffering from uncertainty,” says Auerbach, “and farmers in Gaza also face water shortages and the problem of access to some of the land. In recent times, there has been an invasion of thousands of small snails, who love leafy crops. The use of pesticides destroys everything, the snails and their natural enemies but also pollutes the plants that people eventually eat. Now we are in the process of finding more natural solutions. One option, for example, is to collect the snails manually and use them for fertilizing or as food in fish ponds. We consult with young farmers and graduates from agricultural schools and try new ideas together. After we examine some of the initiatives, we will give them support in this process until they continue on their own,” she says. Abdel Monem Ahmed conducted an experiment to prove the positive effect of organic fertilizers to alleviate the salinity problem in irrigation water. How traditional is the agriculture in Gaza? And what is your impression of the situation in Gaza? “We call it a ‘crisis of hope’, from an economic standpoint. It is not a classic humanitarian crisis like the one occurring now in southern Sudan, or like in other places in Africa where people are starving. However, the living conditions in Gaza are deteriorating every year since economic growth does not meet the population’s growth rate. Every year, the external help increases. Slowly, there is also more entry of goods from Israel. However, living conditions are on the decline. Purchasing power is declining; unemployment is growing, especially among young people. Young educated women have the lowest chance of finding work – their unemployment rate almost reaches 70%. “It’s a ‘crisis of hope’ because life can look almost normal from the outside, but every year it gets harder, especially if you’re a parent – you do not know what the younger generation can do, this is the main problem.